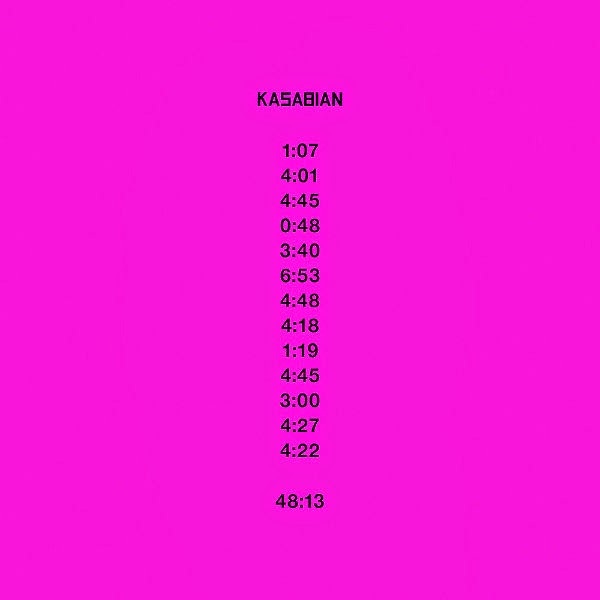 Since the release of lead single eez-eh, you'd be forgiven for thinking that Kasabian's new album '48:13' would give 48 minutes and 13 seconds worth of reasons why this album is dreadful and why the band shouldn't be headlining Glastonbury (you won't find me at the Pyramid Stage on Sunday). In fact, it's easy to see why the band's music is festival-appropriate: it's loud, brash and is sure to get hoards of festival-goers jumping, moshing and shouting in an intoxicated fury. For the most part, though, this is all '48:13' has to offer: loud noise. The new album rarely deviates from the band's lad-rock sound that blends indie and psychedelia in a brash package full of thumping drums, simple yet aggressive guitar riffs and Tom Meighan's monotone whiny vocals. The production is constantly threatening to drown out the vocals - perhaps a blessing in disguise as the childish lyrics are barely worth hearing anyway. The album's title alone is a hint at their lack of creativity. As a whole, the album is kind of like Madness meets Oasis - a compliment to nobody. '48:13' does have its rare moments of calm, thankfully letting us all have a quick breather. treat for example whirrs away in electronic psychedelia; glass switches off the amps to fuse acoustic guitars with space age effects and a spoken monologue in its final third; whilst album closer s.p.s ends it all with a folky ballad (and it's boring as all hell). It's in these tracks that the band have at least bothered to deviate from their usual sound, even if the results are merely a little quieter. That's not to say that '48:13' is a particularly nuanced album. In all, Kasabian have all the subtlety of a crowd of English football hooligans at the World Cup - loud, brutish and infuriating. The album offers a complete lack of melody writing; their songs are only catchy for the repetitive riffs that bludgeon the mind into submission. That might be fine for a rowdy festival crowd, but once the tents have collapsed and everyone's treated themselves to a sh*t and a shave, it'll be far too easy to switch this off. Listen: '48:13' is available now.